Save up to an amazing 35% off all IdealLean Bundles! WHY BUY YOUR IDEALLEAN PRODUCTS IN A BUNDLE? If you’re serious about maximising your fitness efforts and getting the best results you possibly can, IdealLean Bundles could be the key to reaching your goals. IdealLean Protein, BCAAs, and Pre-Workout formulas are designed to work as the perfect team, helping you get the absolute most out of every single workout. You’ll also make a huge saving of up to 35% when you buy your IdealLean Products in a Bundle. It’s a win-win for your budget and your body. These three products are the triple threat you need to take your results to the next level. They’ll work in sync to impact each stage of your training programme, from motivation to recovery, allowing you to maximise your full workout experience. With IdealLean Bundles, you’ll get all three of our delicious products for less! We’ve also given you the option to purchase a full 30, 60, or even 120 day supply. The road to lean has never been so ideal! IdealLean Protein is formulated using high-quality whey protein isolate along with a specially formulated vitamin blend, including Vitamin D, Calcium and Biotin, to help you achieve your fitness goals with added beauty benefits! 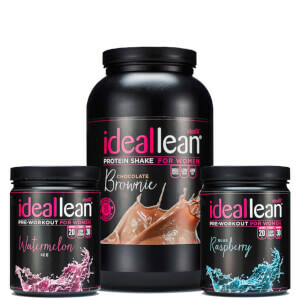 With 23 grams of whey protein isolate and just 100 calories per serving, IdealLean Protein will help to maximise your workout routine without sabotaging your diet! The more active you are, the more protein your body needs to build and maintain muscle. IdealLean Protein is available in 5 delicious flavours and will nourish your body with the nutrients it requires to refuel properly after an intense workout, helping you to achieve the sculpted, lean physique you desire! BCAAs (Branched Chain Amino Acids) contribute to muscle growth and recovery. IdealLean BCAAs are packed with the highest quality amino acids in a 2:1:1 ratio of Leucine, Isoleucine and Valine, to maximise recovery and endurance. They also contain a specially formulated vitamin B blend for healthy looking skin and hair! Available in two delicious flavours, Raspberry Lemonade & Blueberry Pomegranate, each serving of IdealLean BCAAs offers 5g of essential amino acids, the building blocks of protein, to reduce muscle soreness and aid recovery after a workout– all with a low sugar and calorie content! IdealLean Pre-Workout is designed to get you motivated and focused so that you can get fired up for each and every workout. It contains green tea extract which provides you with a natural source of caffeine to support endurance performance capacity, allowing you to reach a whole new level of intensity. Available in 3 fresh flavours, Watermelon-Ice, Cherry Limeade & Blue Raspberry, IdealLean Pre-Workout contains a specially formulated Vitamin B complex, including Niacin, Vitamin B6 and Vitamin B12, which will also help to release energy and reduce the feeling of tiredness and fatigue – all for just 2 calories. How do I use all three supplements together? DO I NEED TO BUY ALL 3 PRODUCTS? When it comes to getting results, you need supplements that are specialised to help you and support your goals in different ways. None of our supplements do the same job. They all support your fitness regime in different ways. IdealLean Pre-Workout will give you the boost that you need to improve your performance during your workout so that you can push yourself and progress with every session. IdealLean BCAAs give you an extra dose of amino acids, the building blocks of protein, which work to help you to recover faster after a workout. The quicker you can recover, the faster you can get back at it! IdealLean Protein helps to provide your body with the muscle-building nutrients that it needs to refuel effectively after a workout. Its high protein, low fat and low sugar formula will support you in maintaining muscle mass which is essential for a lean physique. Each of these unique supplements work together to impact each stage of your fitness regime, helping you reach your goals faster. IdealLean BCAA formula is specifically designed according to the macronutrient and micronutrient requirements of the FEMALE body to help you to achieve a lean body. We’ve also added a specially formulated vitamin B blend for extra beauty benefits!